Student life is the life one cannot go back. Those are the golden days of our life. I am sure a lot of us will have some atrocious yet very hilarious experience of few infamous incidents. Even today at this age those incidents will leave us clueless. With this article, I have tried to bring out some hidden facets our student life. These incidents even today brings a sense of jesting within me at the same time keeps my mouth shut on some of the characters involved in these stories. Although at a hypothetical level we discuss these incidents whenever we meet in a common forum but these are never shared openly. Many times these facts are twisted and turned and then become a new version of the story. Let us pick some of them as we go through this article. 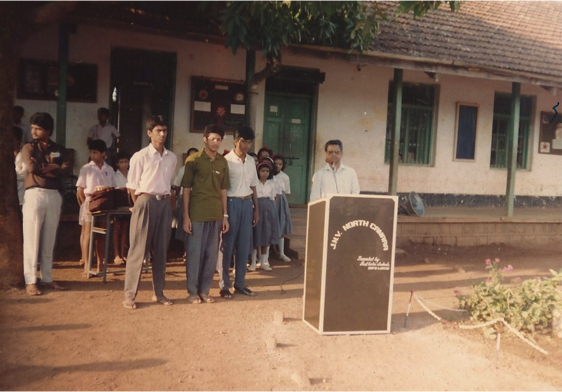 Let’s flash back to 1988 when we started our journey into Navodaya Vidyalaya Shettigeri. We were bunch of kids left in the woods away from our parents and from our family. Shettigeri was a place, which was unique in the sense that it was named after our freedom fighters. The vegetation of Saihadri hill surrounding the school gave a different perspective of life. As the dusk settled in, the place used to get more silent and innocent. If we take the students and our staff from the equation, it literally made the School as an old ancient structure with no life to it. Some of our friends seriously believed in the fact that there were few ghosts roaming around in the dark. It was a short recess after a heavily toiled out Hindi madam’s class. My buddy and I were releasing our pressure next to a tree and my buddy suddenly came up with this conversation. “Le Bhatta illi bootha ideyallo… have you ever seen the flying and singing ghosts in the night?” The statement took me by complete surprise. I laughed at him and said, “Come on boy, nothing here, you must be kidding dude”. But my buddy replied back “Tere ko dikhadoonga Bhatta”. My buddy refused to accept the reality instead he challenged me to be awake in the night and insisted me to accompany him in this act of ghost hunting. Initially, I was not keen to buy his idea but later somehow he convinced me to be a part of his plan to encounter the ghost. It was one of those days where we forgot what was happening around us and we kept dreaming only about the ghosts. There was an awful lot of excitement built up till the mid night to encounter the ghost. Next day morning, Bhairappanna told me that he spotted two ghosts near the fence when he went to release his overdue food. I was laughing within myself yet could not tell him that it was both of us who were near the fence that night!! I am sure a handful of us know the meaning of Jailbreak, don’t we? Jailbreak is a term used mainly by the Apple crazy gadget gurus, which is the process of removing the limitations imposed by Apple on the device running iOS operating system. I must say that the word existed since the beginning of our JNV school life. Though the limitations imposed was different in this instance. “Boys and girls, wake up early in the morning and get ready for Bournvita. Boost is the secret of your energy. Make sure those who are selected for the cluster level competition, have a daily dose of “koli motte”. Get ready and finish five rounds of running before you head onto play kho kho, kabaddi, aatya paatya or practice disk throw, and javelin through. Make sure you shine your shoe before the prayer time. It doesn’t matter how dirty the socks may be” Discipline, discipline and discipline. If someone gets late for the prayer, crawling punishment until our principal sir says stop. This was indeed fun to many of us, at the same time it was indigestible to many. Basya, Parkya, Manjya and Yellya were bit too stronger to digest these sorts of punishment but there were few handful creatures who would struggle to cope with the pace in which things were moving in the Vidyalaya. On that day back in Shettigeri, like the usual custom, we all gathered for the night assembly for our regular head count. Different house leaders counted their respective heads and reported back to the school leader. The school leader took the count and reported back to the teacher who was on the duty. On few occasions we used to have our principal TKK Tatacharyaji wandering around actively monitoring the progress. When our principal sir is around we always used to tuck ours tails and maintain a pin drop silence. We always used to have couple of mute spectators mainly Gajanananna and Bairappanna. Bairappanna always used to stand in a “Vishram” position with a battery (torch) in his hand and both of his feet stuck to the ground always unmoved. On this day, we had our Principal sir taking in charge of the night assembly proceedings. Unfortunately to his horror, sir was up for a major shocker. There was one less head in the final counting figure. Can anyone guess who was that boy? We had this boy who was strongly built, yet shorter in height. For some reason he started to believe that our school was like a Jail and our teachers were like jail superintendents. This may be the influence of watching some Hindi movies like Deewar or Don. We used to watch movies every 15 days normally on a Sunday in the presence of Hindi Madam. Our Art sir normally supplied VCR cassettes. Hindi Madam always used to have non-negotiable very strict rules when it comes to speaking Hindi. As per Hindi madam’s selection, on a given day everyone should speak only in Hindi. Although I must point out that whenever we had this rule, it used to be a celebration day for one of our Hindi speaking friend who basically hailed from the north west part of India but settled near Dandeli with a broken Kannada and a peculiar accent. Although I must admire his confidence in refusing to accept that he was weak in Kannada. There were many trends existed during our school days. To name few, we had “baggi” pants, dogale chaddis and pleated shirts. One trend that was outside the norm was “Appana Angi”. The concept was simple. It was all about getting your favourite dad’s long sleeve shirt, no matter how big or what size but make sure you neatly wear them during the out-of-class and after PET hours. This trend was spotted by some of our boys. The trend was mainly predominant from our girl students simply because one could hardly spot a boy wearing “appana angi” but when a girl wears, this could be easily spotted due to its freestyle nature. One of our junior girls was very often spotted wearing “Appana Angi”. This was the term coined by some of our impeccably genius yet notorious boys and the whole talk about this trend was limited within a small group of boys for a very short period of time. Not to forget, these boys were highly skilled in throwing some interesting banters at each other. On a fine late evening after our dinner, once again it was time for our routine head count. The girl was leading the proceedings as the school leader. I was responsible for providing the head count for my class. The same bunch of impeccably genius yet notorious guys started shouting “Appana Angi” from the backside of the queue. Since I was an expressive character, I could not control my laugh, I went behind the queue and tried to pacify those boys but in the process I uttered loudly “Ye Yakrappa Appana Angi antha heltideera”. The school leader overheard this and the matter was reported to the highest authority, the Principal sir. I was asked to see our principal sir to explain my version and to give my apology. Although, I categorically denied my involvement, at the end it was a mixed feeling of getting caught for no mistake of mine. Very few may term this as banter but I still feel there is a room for “Appana Angi” and by all means it’s a cool trend to be embraced. These impeccably genius yet notorious folks will always come up with a new jargon even if you wear your own “Lungi”. This is not about the American rock band and their debut album but I must say it was the most miscalculated door breakage happened in the history of JNV Uttara Kannada. Not only this was miscalculated mischief, but also in some sense it was completely mishandled until the teachers and the Principal sir came to know about the real perpetrator. The act was perceived as infamous. The damage was definitely evident but consequence of it made everyone pondering and more importantly there were some uneasy tensions caused between all the staff and the students. The whole door-breaking act was bit too physical in nature and tricky to perform. Imagine some of the Bollywood and Sandalwood movies. Imagine you got a corridor passage with a door in front of you and a plain wall behind you. The act was to run like Ussaign Bolt, kick the door and back on to your position within a flash. While performing this act near our famous gymnasium place, one of our boys broke the door and guess what, the door was shattered into pieces and to the guys horror it was one of our teacher’s room door. There was no way to break on through the other side but what he found was a trunk which came all the way from UP. This act was performed during the dusk end of the day hence hardly any spotted this stunt. There was one person from our batch involved in this act, but he was a mute spectator, some even said he was the protector. The boy was unhurt but he went underground for couple of days. A panel of teachers and Principal sir himself identified a list of possible suspects. Suspension letters were typed and kept ready. The letter was sent to parents to come and meet the Principal sir immediately. I was shocked, disappointed and I was in completely miserable state when I heard from Hariharanna that a letter was sent to my home address asking my parents to come and meet the Principal. Thankfully, that letter did not reach my dad as he used to work far away in Dharwad during the week. Two days after the incident, my brother with my uncle arrived at the school gate asking what has happened and why the school has sent a letter to meet the Principal. Fortunately, the matter was settled by then and the real culprit was found. I was happy that I had my second life to continue in the JNV, obviously for no fault of mine but more than that I felt sad about the fact that an innocent act (yet highly unacceptable act) of someone has cost his valuable two years into the JNV School. For those who are not aware of this, Darkstone is an action role-playing game created by a French developer in the year 1999. I think we had already invented this game while we were in class XII in the year 1992. The actual computer game can be played as a single player or in a multiplayer mode. In this case, it had come to my notice that a few of our classmates who were very noble and yet adventurous chose to play a multiplayer game. In the actual computer game, the Multiplayer games may be cooperative or competitive. In our case, the bunch of boys chose to play in a cooperative mode. Unlike the actual computer game, there were no massive destructive weapons or armours involved but these guys chose to make use of low cost natural resources mainly few small stones. The nature of the game was so complex that there was no real target to choose but a couple of lampposts moving in the ground. These lampposts had no fixed location; one could imagine a moving lamppost in the dark, which keeps changing position from one place to another. This game was bit risky in its entireness. When the stones thrown by the players hit the lampposts, there was every possibility that the moving lampposts could take a picture of these folks, and to add to the complexity, these lampposts could make whistle noises when they sense the stones coming at them. The key strategy for this game was to throw the stone and disappear in the dark. I was told that this game was played very professionally during the end of our JNV time. Although there was no real damage done to the lamppost(s), I was told that due to risky nature of the game, the game was played very safely as a secret mission. This is hard to visualize but few of my classmates talk about this game even today in a closed huddle. I would not recommend this game for anyone but you may feel free to try the computer version of the game under a very strict parental supervision. When I gave my entrance examination for Navodaya Vidyalaya, there were no expectations from my parents or my primary school teachers. There were at least half a dozen of bright students ahead of me who were pretty confident of getting selected. I think I was a surprise package in the lot. On a beautiful dusty day in the evening, I was busy doing my daily rituals of playing “hedepente” bat (bat made up of coconut branch) cricket with few kids of my age in the middle of a muddy wet “gedde bayalu” (paddy field). There came this news from my aunt who was also a teacher at my school informing that I got selected for Navodaya!! “Nammane Gappati Navodaya select aayja” was the main news headline for all the neighbours and relatives. Well, the decision was not that complicated. As responsible parents, my mom and dad obviously asked my opinion first. I never really thought about the consequence of leaving home, going to a faraway place at that stage but I was very happy to get away from my current school and explore the new place. From my mother’s perspective, she had one less boy to handle as both I and my brother used to fight a lot at home and always we used to bring our mother as the mediator. Shettigeri, a beautiful place near to Ankola is where I started my journey of Navodaya Vidyalaya. 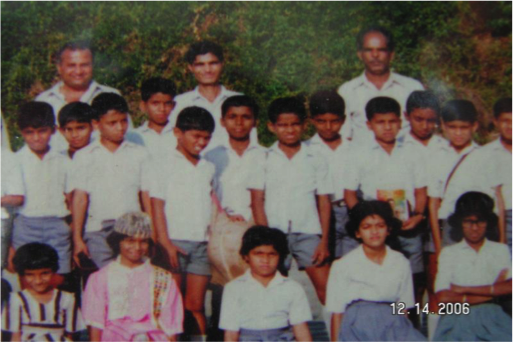 I still remember the first day of my Navodaya! In fact, I was the first student to enrol. Everything was new to me. 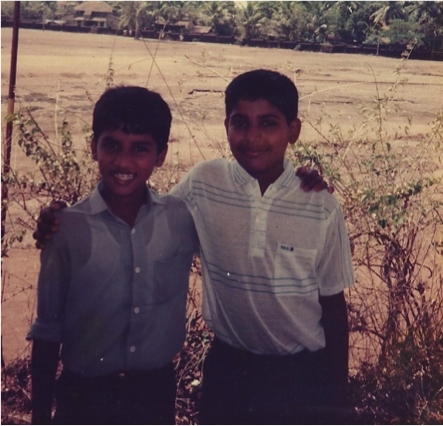 My first friend at the JNV was Vinay Vernekar. 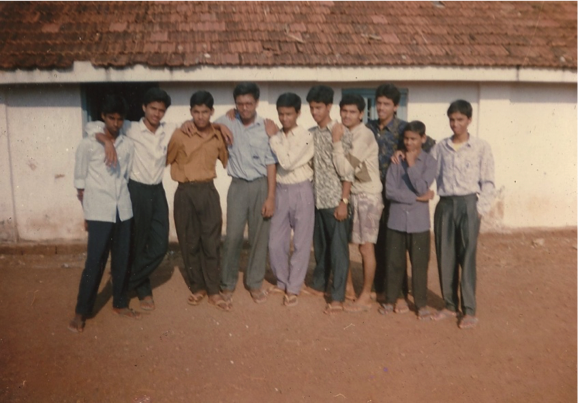 The first week away from home was the most unforgettable moments of my Navodaya life. Every face in the dormitory was unknown. We had new teachers, new routine, and brand new double decker cots in the dormitory. We all spoke the same language but there was one fellow Rajendra Shekawat who could hardly speak Kannada. There were loads of things to explore in the school. I just somehow went through the first week of JNV. I was eagerly waiting for my parents to visit me on a sunny Sunday, Feb 7th 1988!! The eagerness busted into tears when I saw my parents after a gap of one week. Believe or not, we had one girl called Suchitra Nayak who actually hails from a nearby village of Ankola. She was crying like mad even though her house was a stone throw away from the Shettigeri School!! The rest all is part of the history!! I don’t know why, but I was made the house leader for the newly formed “Shakthi” house. My favourite PE Teacher Mr Bharshetty sir was my housemaster and our music madam was o ur housemistress. 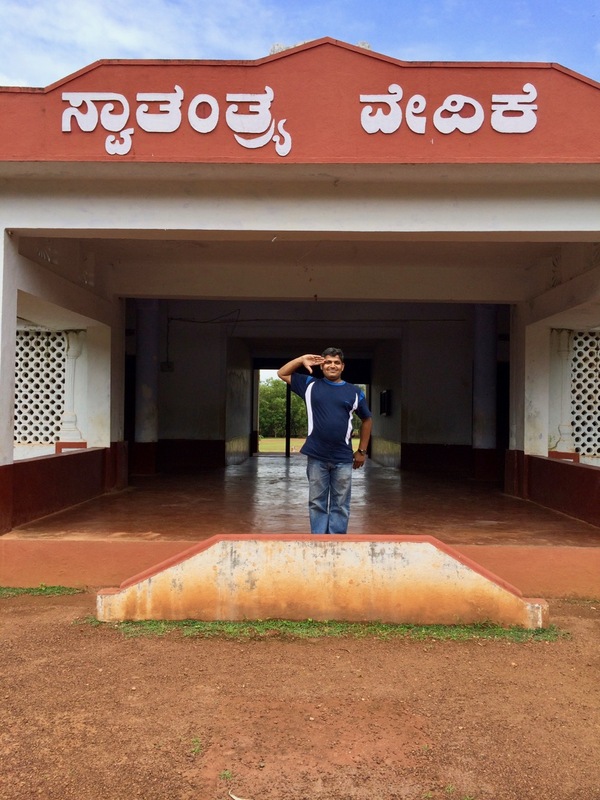 Once we had a visit from our Uttara Kannada district commissioner coming to our school for a special visit and we had to do a march fast from the shettigeri school gate to the school entrance. 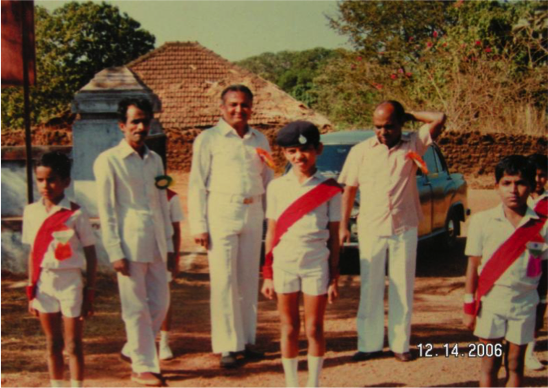 I was chosen as one of the “sainik” along with the school leader Vinod Shanbag, Shrinivas Naik, Manjunath Naik (we call him Logi for is enormous reflux while fielding) and Vivek Borkar! Those initial days taught us discipline, patience and the core values, which I still try to follow as a routine. I remember we had the first half term vacation to start, on that day our parents were supposed to come to the school and pick us for 10 days of break. I was sitting in the classroom thinking and looking somewhere. Unfortunately, that was our Hindi madam’s class and she immediately sent me out of the class asking me to sit as “Murga” for indefinite time. Our beloved housemaster and the PET sir were passing through and asked me in a worried tone, “Yen aaythappa GM”! I was just crying without controlling my emotions! I still remember Mr Bharshetty sir taking a bit of fight with Hindi madam telling that the punishment was bit harsh on his “shishya”. All was fair and good at the end!! More than mourning about the punishment we learnt good discipline during our early part of our Navodaya. Shakthi house was full of drama and fun, we did well as a team in many of the inter house competition! We had some talented individuals in our house. Shakthi, Bhakthi, Keerthi were the initial houses which many of us from Shettigeri days relate to each other and adding to our excitement we had TKK Tatacharya sir as he principal who always tried to infuse the Sainik School culture into the Navodaya! , Mukund used to be bit lenient with me when it comes to the hairstyle! 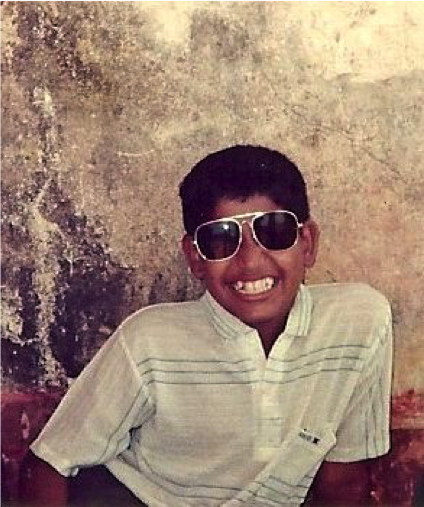 All I remember Mukund telling me “GM Bhat, this hairstyle looks great!” Not to forget, those were the days we were trying to be smart and look nice with“iStyle”, may of you know why!! Whether you call it as my fate, our PET sir found out during the evening assembly count that my haircut was not done as per the specification. “Ye GM Bhat B@@d S@! !£ M%^&£ Yenle… THAAAAD” well, the rest is as we say history. Once again the discipline, consistency and equality is what we had great pride to take away from our school days! Finally – The graduation day! It is indeed hard task to describe on a page about how those six years of JNV life was spent. We were at times notorious but quite often brilliant!! We had lot of things to share between us. Each one of us lived, breathed, ate, played and relaxed together. If someone asks me to quote a best example on the teamwork and team ethics, I would quote our JNV life without any hesitation. We had number of migrated students from Uttar Pradesh and Madhya Pradesh, but there were no language barrier between the students. We took the entire social studies examination in Hindi medium in our class X curriculum. Writing an examination in Hindi medium was not perceived as a challenge at all. Thankfully, we managed to pass by a good margin. I believe the hardest thing for any of our JNV Alumni is to pick and quote the best and the most unforgettable moment of the school, because every moment was so brilliant and fantastic. We had seen many teachers join us in the journey for a brief time but every one of them has left their own unique mark in our heart and soul. We had seen some lows and highs of JNV and our fellow students. One of my colleagues here in the United Kingdom asked me very politely after looking our old pictures, “Oh! You guys were on bare feet”, I answered her smiling “yes we were in bare foot, that’s how our life was”! (that was for the time when we used to loose our sandals given by the school). The key thing is that today, when we reflect back, everything looks so nice. I still remember the last Morning Prayer session where we presented a “Dias” as a token of our remembrance after a lot of deliberation among our classmates! Today, there are 1500+ students have successfully completed their Navodaya life but I guess the only thing that is common among us is those quality days we spent together throughout our golden journey of JNV life! I have only one message to those young and bright children currently studying in the Navodaya – “Please enjoy what you do. Think about the good things you have done in your life and always keep motivated to succeed”. I think we all owe to our childhood and I am sure the friendship, laugh and cry we had together will always lasts long and we can never ever forget those golden moments of our childhood. ಕಹೋ ಯುಕೆ – ಚಕ್ರವರ್ತಿ ಸೂಲಿಬೆಲೆ ಯಾಕೆ? Kavita on Please spare some thoughts! © 2016 Gana Bhat. All Rights Reserved.